Ad Astra Per Aspera: Selinger, Scroggins, O’Leary, and Bettridge, Louisville, 2011 (? )—a while ago for sure. The estimable Joel Bettridge has published a penetrating book in the Routledge Interdisciplinary Perspectives on Literature series entitled Avant-Garde Pieties: Aesthetics, Race, and the Renewal of Innovative Poetics. The fourth chapter, entitled “Case Studies,” includes a reading of Phosphorescence of Thought in relation to Claudia Rankine’s Don’t Let Me Be Lonely and Kenneth Goldsmith’s The Weather. Strange bedfellows! But Bettridge’s reading is unusually astute. He really gets the poem. Here’s a PDF of his reading of my poem. Bettridge on Phosphorescence of Thought. And if you’re interested, Avant-Garde Pieties. 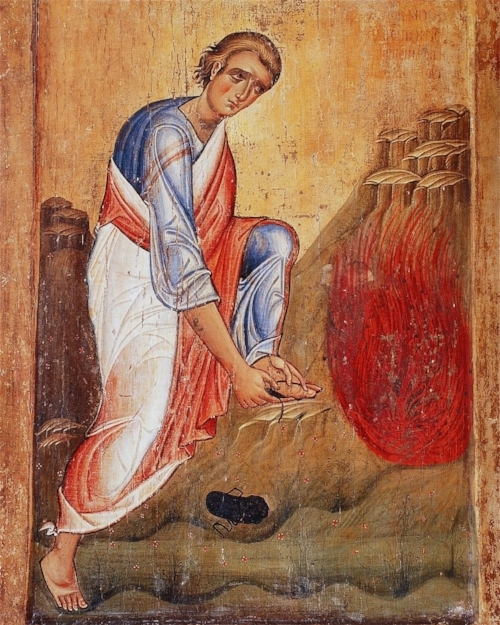 Icon of Moses on Sinai at the Burning Bush, 13th century, St. Catherine's Monastery. Take off thy sandals from off thy feet. "Do we have a functional grammar for theological reflection in poetry today? This question has served as a guiding principle in the choice of much of my reading lately. Peter O’Leary’s recent collection of critical essays, Thick and Dazzling Darkness: Religious Poetry in a Secular Age, is doubly ambitious. He not only conducts original, searching readings of nine contemporary poets—among them Geoffrey Hill, Fanny Howe, Robert Duncan, and Nathaniel Mackey—but also convincingly argues a “way forward for poetry” that would honor twentieth-century experimentation and pioneering, while at the same time refashioning a language within which intimations of anagogy and apocalypse might seriously contend. O’Leary’s definition of “religion” is capacious enough to include all manner of syncretism and heterodoxy and yet restrained enough to serve as a transformative (even troublesome) force in the poetry he examines. His critical style is refreshingly personal, even anecdotal." I also conducted an interview with Mark Franzen for the Lumen Christi podcast. Stay tuned for that! Icon of the Second Coming. Greece. From around 1700. Two upcoming appearances. Well, actually three. The first is two-for-one. On Friday, February 23 and Saturday, February 24, 2018, I will be participating in two panels at the Louisville Conference on Literature and Culture since 1900. On Friday, February 23, I'll be a respondent on a panel including the work of the great poet Márton Koppány. Here's one of Márton's poems. 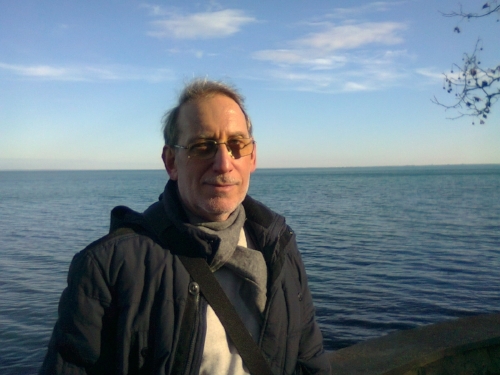 And here's a photo of Márton at Lake Balaton in Hungary. Here is a photo of Tarn and myself, taken in Santa Fe in July 2016. Look at that beautiful Cultural Society t-shirt. Back in Chicago, on Thursday, March 1, 2018, at 4:30 p.m. in Swift Hall at the Divinity School of the University of Chicago, I will be speaking about Thick and Dazzling Darkness for the Lumen Christi Institute. Here are the details for the event. There's a full Moon opposed to the Sun conjunct Neptune, so it's bound to be mystically potent. I'll be speaking among other things on the work of Frank Samperi, Fanny Howe, Joseph Donahue, and Pam Rehm. So, what are you waiting for? HURRY UP PLEASE IT'S TIME. A new book of critical prose, Thick and Dazzling Darkness: Religious Poetry in a Secular Age, will be published this November by Columbia University Press. I am stoked. This represents over fifteen years of work; its appearance (I'm tempted to say "epiphany") fulfills long labor. In Thick and Dazzling Darkness, Peter O’Leary offers a new reading of modern and contemporary poets’ treatment of religion and the nature of the divine in a secular age. The book seeks to come to terms with an often obscured spiritual impulse that drives the production and imagination of American poetry. O’Leary presents close and comprehensive readings of the modernist, late-modernist, and postmodern poets Robinson Jeffers, Frank Samperi, and Robert Duncan, as well as the contemporary poets Joseph Donahue, Geoffrey Hill, Fanny Howe, Nathaniel Mackey, Pam Rehm, and Lissa Wolsak. He argues that an anxiety of misunderstanding exists in the study and writing of poetry between secular and religious impulses and that the religious nature of poets’ works is too often marginalized. Examining the works of a specific poet in each chapter, O’Leary reveals their complexity and offers a defense of the value and meaning of religious poetry against the grain of a secular society. Thick and Dazzling Darkness undertakes the daunting task of exploring spirituality (qua poetry) in a way that connects such otherwise dissimilar poets as the self-consciously backward-looking Robinson Jeffers, the peculiarly American modernism of Robert Duncan, and the (at)tendent postmodernism of Fanny Howe and Nathaniel Mackey. O'Leary creates a conceptual fabric through which we can "read" this diverse group of poets—some well-served in scholarly circles, others rapidly falling off the American poetry radar. Given our cultural predicament as Americans, this work could not be more timely. It is my understanding that this book will also be available through the Knowledge Unlatched platform. Stay tuned for details. And in the meantime, convince your libraries - local and university - to buy a copy! The Tarn, in his native habitat. At Lute & Drum, the cosmophanic internet potentia edited by Ken Taylor and Pete Moore, Nathaniel Tarn reflects on The Sampo, about which he says, among other things, "Basing himself on entry into one of the greatest of all human fables, O’Leary confirms that the North could hold its explosive but purely lyrical epics against anything that the South could produce and with perhaps the greatest and most solemn celebration of chivalry, albeit without ever departing from the commons, kin to the Arthurian legends, the Icelandic sagas, the medieval splendors of Middle High German." Do you have your Sampo yet? Robert Duncan's page from Ronald Johnson's Holograph Book, from the 1960s. Elspeth Healy, one of the special collections librarians at the Kenneth Spencer Research Collection in the Kansas University libraries, sent me a note recently to a link a little essay, "Bound for Heaven," by Angus Brown, who was researching Ronald Johnson's papers at the Spencer and was shown one of the two volumes of Johnson's Holograph Books in the collection, which includes the splendid page drawing above made by Robert Duncan. When I first met Johnson in the summer of 1992, visiting him at his apartment on Elgin Place in San Francisco, he showed me both of these Holograph Books, which he had kept during the years he and Jonathan Williams were together, much of which was spent on the move, whether covering the length of the Appalachian Trail or wandering around England. Wherever they went, Johnson would collect signatures of the poets, artists, and other people they encountered. As I recall, one page contains Ezra Pound's signature; another, a drawing by Franz Kline. When my brother Michael and I visited Johnson in the summer of 1993, he showed us the Holograph Books at my request. Even still, they inform my sense of some of what a life in poetry involves: Meeting and talking to poets in these intersecting circuits wherever you go. The instinct to collect a page from each of them along the way continues to feel inspired. When Johnson was dying in early 1998, he sold off much of his personal library to cover debts and obligations. This included the Holograph Books, which went to Peter Howard at Serendipity Books (no longer in operation), and then circulated for some years until Kansas and the Spencer acquired them in 2011. Angus Brown's essay is a sweet reminder of how excellent a thing these Holograph Books are. Within his essay is a link to an enthusiastic treatment of Johnson's ARK, written by Stephen Ross, another Briton who has caught the RJ fever. Michael became a friend a decade ago. I met him a few times but mainly we corresponded. His letters were like his poems: shrewd, apostrophaic, honest. I’ll miss them, and him. May he rest in peace. Upcoming readings in North Carolina and Milwaukee. I have three readings upcoming in North Carolina. On Wednesday, September 14, 2016, I'll be reading at Arcana Bar & Lounge in Durham, courtesy of Lute & Drum. Reading begins at 8 p.m. Be there! On Thursday, September 15, 2016, I'll be reading at Saint Andrews University in Laurinsberg, as part of the Black Mountain College Festival, courtesy of the great Whit Griffin. Reading begins at 8 p.m.
On Friday, September 16, 2016, I'll be reading in Asheville at the Black Mountain College Museum, with my homie Steven Manuel, courtesy of Jeff Davis and MadHat's Poetry. Reading begins at 7:30 p.m.
O'Learys on the Linyanti River, Botswana, with Esse, our guide. Finally, on Sunday, September 25, 2016, at 2 p.m., I will be reading at Woodland Pattern Book Center with my brother Michael, pictured above, and Amy Evans, coming over from the U.K. Reading begins at 2 p.m.
Robert Adamson on The Sampo. The great Bob Adamson, one of my favorite poets, has given a shout out to The Sampo in the "Reading List" feature at the Poetry Foundation's Harriet. Adamson edited an Australian edition of Poetry, which has rich contents, including an introduction by Devin Johnston. All worth reading.